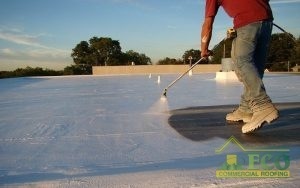 Count on ECO Commercial Roofing For All Of Your Roofing Needs. ECO Commercial Roofing is your trusted commercial roofing company for services in Texas, Louisiana, and Mississippi! We offer full-scale industrial and commercial services covering a roofing system’s entire life-cycle. With more than 20 years of construction expertise, ECO Commercial Roofing proudly serves Texas, Louisiana, and Mississippi with integrity & conscientious service. We have the knowledge, resources, and experience to install and maintain your roof through repairs, maintenance, restoration, and re-roofing. To learn more, or to get started, give us a call today at (833) 200-0571! Did you know that each year over $1 billion is spent on roof replacements due to premature roof failure? Premature roof failure stems from improper installation, as well as poor maintenance, and our team can help you with both of those issues. Through the use of quality materials and excellent craftsmanship, we can help preserve your roofing asset and help you obtain strong return-on-investment. Our mission is straightforward: to be an industry leader in standards of value, quality, integrity, and customer satisfaction. To offer the best value to our customers, we are an official installer of high-performance roof systems from Conklin®. This manufacturer has been a nationally-recognized leader in the construction, restoration, and waterproofing markets for 35+ years. Over the last few decades, many innovations have arisen in the construction industry. With this new wave, new building priorities have grown into industry standards: sustainability, energy efficiency, and “renewable” technologies. At ECO Commercial Roofing, we understand it is our responsibility to not only provide exceptional customer value. It is also to set new standards and create a responsible, sustainable future starting today. This is why we apply seamless, reflective roof systems providing superior “green” value, smaller impact, and greater energy savings over time. As our namesake shows, ECO Commercial Roofing is committed to cost efficiency, responsibility, and sustainability. We provide solutions which are economical for company budgeting as well as environmental well-being. Why Choose ECO Commercial Roofing? At ECO Commercial Roofing, our mission is to design and then build high quality, and highly detailed, homes and pole barns with unparalleled craftsmanship. We also provide services for roof repairs or reconstructions, and remodels, too! We build each project with as much care as if it was going to be an addition to our own homes, and we craft the designs to your precise specifications. We choose to only partner with the most efficient and reliable local subcontractors, and we stand by the undeniable quality of our work. Big or small, elegant or demure, ECO Commercial Roofing is the premier choice for your family’s next building project. To get started, give our team a call today at (833) 200-0571. Corey Smith started his long journey in East Texas in 1998. He has an extensive career in real estate and construction industries such as engineering, construction, design, and innovation. Camilla graduated from the University of Houston- Clear Lake in 2012 with a Bachelors in Business Management and a concentration in Leadership. With a strong will, she achieved success working in retail for 8+ years managing several successful locations for many different brands. Eventually, she was called into the finance department at Texas Built Homes where she works daily on accounting, managing the office, and scheduling. You can count on our 20+ year background, superior roofing expertise, and quality roof systems for the solutions you need! Call the roofing experts at ECO Commercial Roofing in Texas, Louisiana, and Mississippi today for a professional roof estimate at (833) 200-0571! Updated on July 13, 2018 at 4:24 pm by ECO Roofing.